I am 68 years Old and in the recent months have started to get Hip and joint pain if sitting, standing or walking to long. 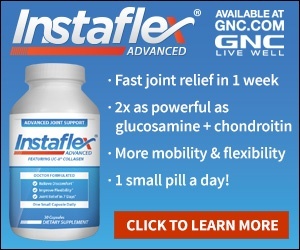 I have only been on Instaflex Advance for less than a week - and have noticed NO stiffness pain in the area already. I bought it from GNC and went with Advance because I am going to Europe and plan to do some sight seeing. So Far so Good. The GNC representative explained everything to me even that it may take longer to kick in, but I believe because I got it early, after a few months of pain, that I may have worked for me earlier than others who have more serious joint pains. Product or Service Mentioned: Instaflex Advanced Joint Support Supplement. Reason of review: I bought the product and not a free sample..
Review #869760 is a subjective opinion of testimonial.